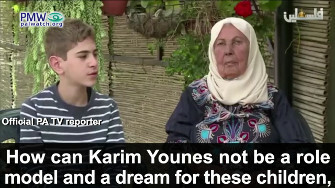 as a sign of appreciation for his role and sacrifice"
On the contrary, you bring us pride"
Karim and Maher Younes are Israeli Arab terrorists serving a 40-year sentence for having kidnapped and murdered Israeli soldier Avraham Bromberg in 1980. They are among the Palestinian Authority's so-called "veteran" prisoners, and as such are glorified tremendously by the PA. 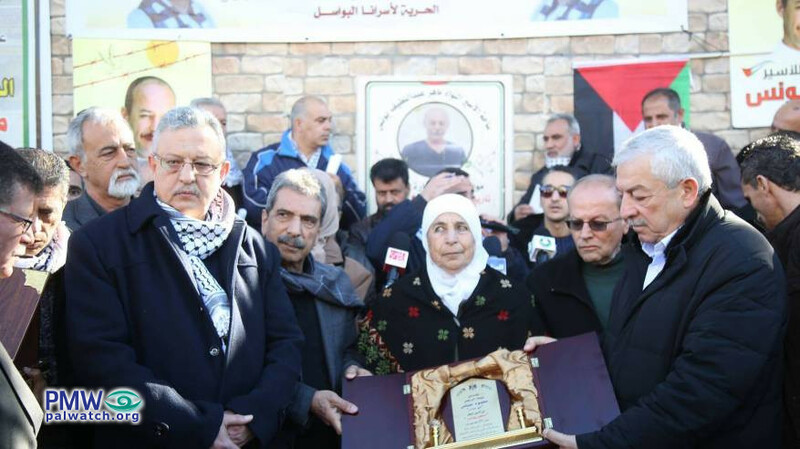 The fact that they have both "endured" 36 years in prison was celebrated by the PA this month. "Under the auspices" of PA Chairman Abbas, the Tulkarem district held a "rally of solidarity" in Maher Younes' honor with the participation of Fatah Deputy Chairman and Abbas' representative Mahmoud Al-Aloul, Fatah Central Committee member Tawfiq Tirawi, Tulkarem District Governor Issam Abu Bakr, Director of PLO Commission of Prisoners' Affairs Qadri Abu Bakr, and PA-funded Prisoners' Club Chairman Qadura Fares. "The board of governors of Al-Istiqlal University has decided to present prisoner Maher Younes with an honorary certificate in military science as a sign of appreciation for his role and sacrifice." 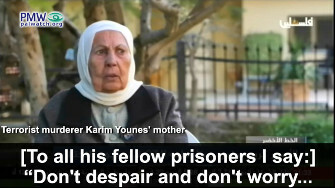 Text on left: "Freedom for our brave prisoners"
Text at top: "Imprisoned since Jan. 6, 1983"
Text at bottom: "Karim Younes"
I told him: 'Don't worry... You did nothing wrong.' ... [To all his fellow prisoners I say:] 'Don't despair and don't worry... You did nothing wrong that harms your families or [causes] them to be ashamed of your actions. On the contrary, you bring us pride.'" 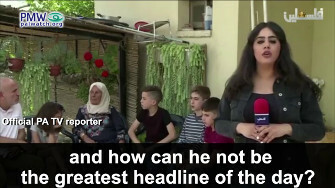 Official PA TV reporter: "By becoming a symbol of adherence to the [Palestinian] cause and the land, he has turned into a source of pride for his town 'Ara within the Green Line (i.e., Israel,) and to all of Palestine." 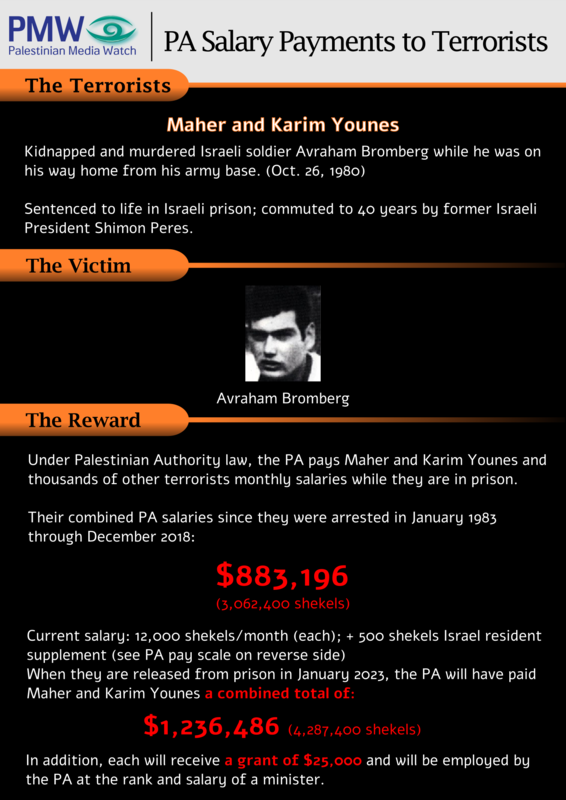 As terrorist prisoners, Karim and Maher Younes are on the PA's payroll as part of their "Pay for Slay" program that rewards terrorists and murderers with generous salaries. Palestinian Media Watch has calculated that the cousins' combined PA salary since they were arrested in 1983 through and including December 2018 was at least 3,062,400 Israeli shekels - the equivalent of $883,196. Both are currently getting 12,000 shekels/month plus a 500 shekel Israeli resident supplement. These recent events illustrate the PA's continued glorification of these two murderers. 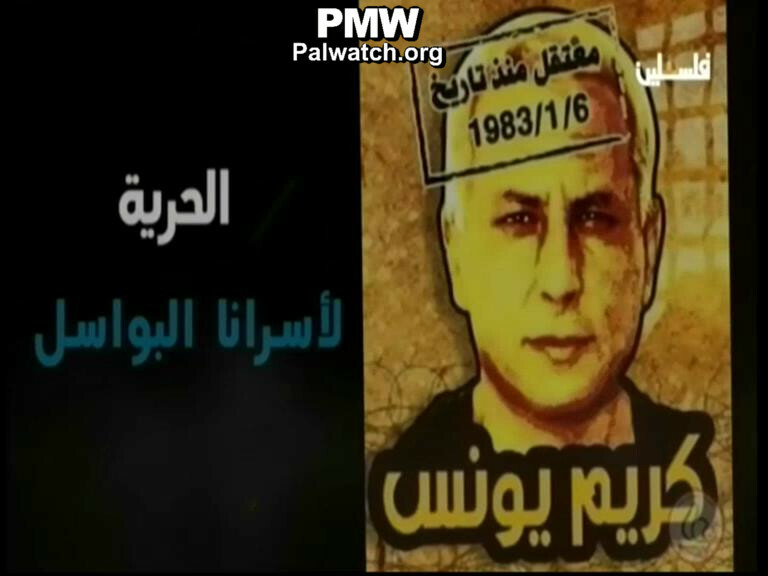 PMW has documented that PA and Fatah Chairman Abbas appointed Karim Younes to Fatah's Central Committee, and that the PA named a square after him in Jenin and one after his cousin Maher Younes in Tulkarem. 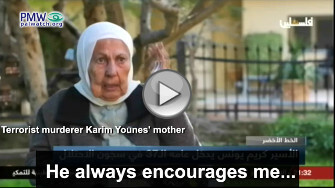 Two months ago, Abbas hosted Karim Younes' mother and brother as his guests. 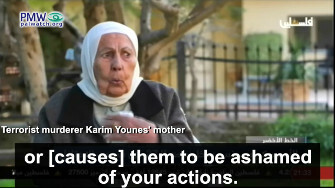 Terrorist murderer Karim Younes' mother: "He [Karim Younes] is the one that strengthens my endurance: 'Mom, I didn't do [anything wrong] - I didn't steal. I didn't harass a woman. I did nothing for you to be ashamed of. On the contrary, mom.' He always encourages me... I told him: 'Don't worry... You did nothing wrong.' ... [To all his fellow prisoners I say:] 'Don't despair and don't worry... You did nothing wrong that harms your families or [causes] them to be ashamed of your actions. On the contrary, you bring us pride.'" 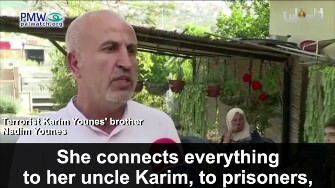 Terrorist Karim Younes' brother Nadim Younes: "The prisoners and their determination are the torch. Hold on and be resolute, we are behind you and before you in all arenas of the struggle, and will not desert you. Of course, it is known that no one need advise them. They are a symbol of determination and resolve." Headline: "Under the auspices of the [PA] president and with wide official and popular presence - Tulkarem honors prisoner Maher Younes on the completion of 37 (sic., 36) years of his imprisonment"
"In cooperation with the family of prisoner Maher Younes (i.e., terrorist, murdered 1 together with an accomplice) and under the auspices of [PA] President Mahmoud Abbas, the Tulkarem district yesterday [Jan. 19, 2019] held a rally of solidarity with prisoner Younes on the completion of 37 (sic., 36) years of his imprisonment in the occupation's prison. He noted that Tawfiq Tirawi informed him that the board of governors of Al-Istiqlal University (i.e., the PA Security Forces university in Jericho) has decided to present prisoner Maher Younes with an honorary certificate in military science as a sign of appreciation for his role and sacrifice. Al-Aloul added: 'The prisoners' sacrifice is one of the greatest kinds of sacrifice, because they have sacrificed their freedom for the freedom of their people and their homeland. Therefore they are in the hearts of the members of our people, who recompense loyalty with loyalty through solidarity rallies like these in Tulkarem and the rest of the homeland's districts.'" Maher Younes - Israeli Arab serving a 40-year sentence for kidnapping and murdering Israeli soldier Avraham Bromberg in 1980 together with his cousin Karim Younes. 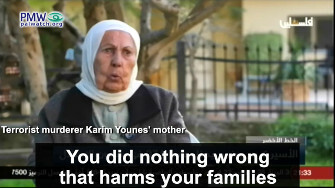 Younes was originally sentenced to life in prison, but Israeli President Shimon Peres reduced his sentence in 2012.